Group: English. Class: 1a. Time: 15 minutes. I. To improve E--'s reading. II. To enlarge his vocabulary. III. To make him think. Step I.--Tell E- a little about the piece of poetry- "A Friend in the Garden," by Mrs. Ewing--that he is going to read, so as to arouse his interest. Step II.--Take the first line, "He is not John the gardener," and let E-- read the word "gardener," using the powers of the letters, and not their names. Write it up on the blackboard, in order to impress it appearance on his mind. Then take [teach] the word "John," and then [teach the word] "not," and from this last [i.e. only from not] make a column of words on the blackboard, by simply changing the initial letter, letting E-- furnish the words. Then let the line be read straight through. Step III.-- Take the next line-- "And yet the whole day long," beginning again with the most difficult words, "whole" and "long," and from "and" and "long" write columns of words on the board. Step IV.--Take the third line--"Employs himself most usefully," in the same way, beginning with "employs" and "usefully." Step V.--Take the fourth line-- "The flower-beds among," in the same way. Step VI.--Let E-- read the verse straight through. Step VII.-- Read the other verses of the poems to him, and show him a picture of a "friendly toad." 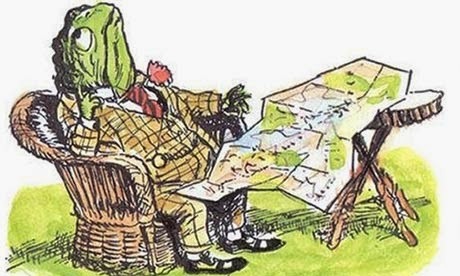 I just have to comment to say that I just this afternoon read Wind in the Willows to my son and we encountered this very image of Toad in our book. I love when these things happen. Love having more insight to early reading lessons. Thanks for sharing!